Emily, Aria and Spencer bicker as they dig up a grave for a body. Emily says that there must be another way, and Spencer informs her that it had to come to "first degree murder." We jump four days earlier as the gals and guys look in shock at Mary Drake. Toby follows her into the station and she informs him that she's Jessica's sister. The gang run into the church after a text from A.D informs them that Hanna will die by the bell tower. They run in and find her lifeless body hanging, but when they cut it down, it's a mask of Hanna on a doll. They are given 24 hours to deliver Charlotte's murderer to A. They make a command station in Spencer's home and put names into a bowl for who they think is the killer. Alison emerges as a front runner, followed by Mona and Spencer. They split up on seperate missions. Aria and Ezra break into Ali's house and go through her things, but Elliot returns home and opens a chest with what looks like A attire. He then opens a bag with what loads like loads of surgical equipment. Spencer stays home and tries to contact Caleb, but he cuts her off without saying bye. Caleb and Mona are looking at Mary and she is taking things into a van and Mona concludes that it's to murder Hanna, while Caleb says they should follow her. They are shocked when she goes to Spencer's house. Caleb texts her, but Mary makes it in there first. Spencer quizzes her and Mary opens up about her past, saying Jessica was jealous of her. Hanna is electrocuted by her captor. Mona realizes that the man Mary is talking to is British and he's calling from the bar at Hollis. Aria goes there and looks around, but her and Ezra's song comes on and she goes to see him. Spencer appears to Hanna in a dream and tells her to stay strong. Ali admits to Cece's murder in her sleep. Spencer goes to the house to check the stuff Ali was giving to goodwill and finds the jacket that Aria and Ezra saw that night. She then goes to the team to tell them about it. Emily is scared to hand Ali over, but the team maintain that Hanna isn't guilty. Caleb steals the jacket and Spencer's cell and goes to take everything to A. He texts in the nick of time. 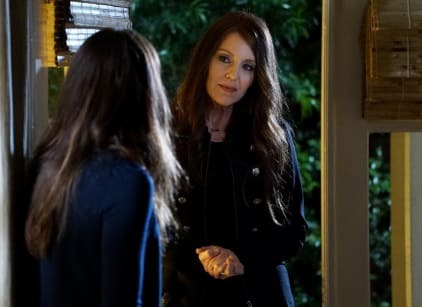 Hanna escaped, but bumped into Mary Drake on the way out. Alison’s not the only one seeing ghosts tonight. Permalink: Alison’s not the only one seeing ghosts tonight. Emily: There must be another way. Spencer: There is no other way, Emily. It was a well thought out plan, but when it ends like this it’s called first degree murder. Pretty Little Liars Round Table: Who Do The Liars Murder?! ?